9/20/2014 The attacking creatures that the destroyed creature was blocking remain blocked (even if no other creatures were blocking them). 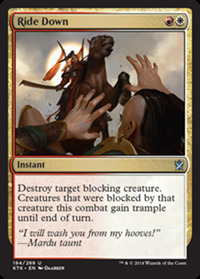 An attacking creature with trample that has no creature blocking it can deal its combat damage to the defending player or planeswalker. 9/20/2014 In some rare cases, the blocking creature wasn’t declared as a blocking creature that combat (for example, if it entered the battlefield blocking). In that case, the attacking creatures it was blocking won’t gain trample even though the blocking creature is destroyed. 7/13/2016 The attacking creatures that the destroyed creature was blocking remain blocked (even if no other creatures were blocking them). An attacking creature with trample that has no creature blocking it will deal its combat damage to the defending player or planeswalker. 7/13/2016 In some rare cases, the blocking creature wasn’t declared as a blocking creature that combat (for example, if it entered the battlefield blocking). In that case, the attacking creatures it was blocking won’t gain trample even though the blocking creature is destroyed.